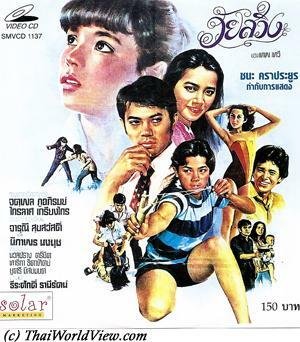 Thai movie หนึ่งน้องนางเดียว was released in year 1980 and lasts 1h18mn. Maybe the movie was cut or censored as it is a short duration for a movie. The picture quality is average. This movie is remake of movie หนึ่งน้องนางเดียว released in year 1959. The mother is played by Marasri Isarangkul. The poor family adopts an orphelin Phayak on top of their current child Phayak. Many years have passed. Narit (Sombat Methanee) is riding horse with his fiancee Nathee. Suddenly Narit falls from a horse (ตกม้า) as a snake attacks it. He gets help from PlaiWan (Pissamai Wilaisak). Phayak (ณัฐ ไชยยงค์) is her brother, who is a hunchback. Narit seduces PlaiWan (คนกรุงเทพพูดหวานอย่างนี้ทุกคนหรือค่ะ?). Phayak doesn't trust Narit. While her parents are away to cure the father's heart disease, PlaiWan and Narit become lovers. Phayak blames his sister (ใจง่าย). The father, knowing that her daughter was too easy, has a heart attack and dies. Narit is back to Bangkok and promises to come back as soon as possible. A child is born but Narit is still not back so PlaiWan decides to to Bangkok. Chosri Misommon is playing a domestic helper. Narit had to marry Nathee (Tharika Thidathip) due to some debt towards parents. In front of Nathee, Narit ignores PlaiWan and his child (เลวกว่าหมา). Narit chases them. Back home, the baby is dead and the mother dies also. PlaiWan and Phayak burn the house and leave the area to start a new life. They settle in South of Thailand and make a living by fishing. An old sorceress predicts to PlaiWan that Narit will come back to her as a slave. A spirit (ปู่) tells to Phayak where a treasure is located in the sea. They become rich and buy a beautiful home. PlaiWan is renamed as Fatima. Narit meets Fatima but he doesn't recognize PlaiWan. They become lovers again causing Phayak's ire towards this (หมาป่า). Phayak is going overseas to remove his hunch. Narit meets Methinee, a business woman but he doesn’t realize she is PlaiWan (ไม่จริงจัง). Phayak kidnaps Narit to get revenge over him. He also lies to Nathee in order to seduce her. He tortures Narit’s body but also Narit’s spirit by telling his fiancee is now his! Nathee grabs a gun but Phayak shoots her. The police arrives and shootings happen. PlaiWan releases Narit as Phayak has gone too far. Phayak finally dies as he was willing to revenge PlaiWan’s honor. Pina (Jatuphol Poopirom) and Nuan (Penpak Sirikul) just get married. Pina is a farm owner and Nuan is a Bangkokian lady. Nuan simulates to be sick in order to avoid bed time with her husband and verifies if her husband really loves her sincerely or not. She is worried about a minor wife (เมียเก็บช่อน). They stay at countryside in a cow farm. Nuan learns that Pina sold 20 cows (เสีย20ตัว) to pay for the engagement ceremony. It is a big sacrifice for a farmer, so it shows his sincerity. They can become wife and husband (สมบูรณ์). Nuan beauty is well known during the district (เมียสวยเหมือนนางฟ้า). During a stormy night, they help a man called Pratchai, who invites them to Phuket to thank them. Pratchai is very interested in Nuan, who is a former model (นางแบบ). Pratchai is a swet man (หวาน). He takes profit that Pina doesn't know how to swim in order to invite Nuan for a boat trip. He tries to take advantage towards her but to no avail. Nuan is fed up by countryside life as Pina spends a lot of time drinking with his coworkers. She wants him to spend time with her and less with his friends. 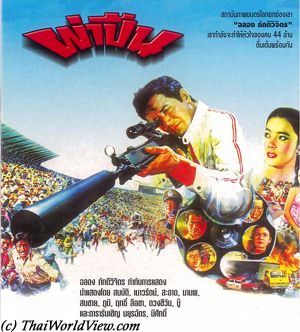 Similar to many other Thai movies, this movie features bad taste live vomit sessions in toilets. A young village lady is preparing food for Pina as he is fed up with Nuan's cooking style. It is too much for Nuan (เบื่อ). She quits (ลาก่อน) and goes back to Bangkok to stay with her mother. Nuan is asking to Pratchai a model job to cause jealousy to Pina. Pratchai invites Nuan to his home. He offers a ring to her and tries again to abuse her but Nuan doesn't forget that she is married. Pina is injured by ruffians attacking his farm. Nuan goes back home to take care about him. Pratchai comes to apologize so Pina and Nuan can live a happy married life. It is a polite romantic movie with particles krap (ครับ) and kha (ค่ะ) used between wife and husband, mother and daughter. Respectable expressions Khun Phujing (คุณผู้หญิง) and Khun Phuchai (คุณผู้ชาย) is used by farmers to name Nuan and Pina. Two friends, Som living in Chiang Mai and Daeng in Bangkok, are in love with two Chiang Mai girls. Following a dramatic misunderstanding, the two friends set apart as Daeng is wrongly accused of courting Som's girl friend and being responsible of her pregnancy. Disappointed by Daeng's behavior, Som marries Daeng's girlfriend, who is also pregnant. Twenty years later, their children meet in Chiang Mai. Will they be able to have a love story after their parents' failure twenty years ago? 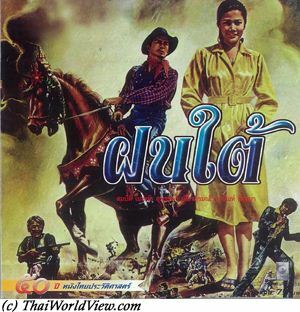 Thai movie เงาะป่า was released in year 1980 and lasts 1h32mn. It was released under VCD format. It was remastered in full HD format by Five Star production in mid-2010s. Movie director is Piak Poster. This movie takes place in a tribe located in a forest. They have all a dark skin so are called "เงาะป่า" tribe. Sompla (Jatuphol Poopirom) is a young fearless man skilled in animal hunt with blowpipe and knowledgeable in medicinal herbs and plants. The tribe is wearing clothes like South Pacific tribes. Lamhap (ศศิธร ปิยะกาญจน์) is the daughter of the local sorcerer (หมอผี). The local sorcerer would like Sompla to become the next sorcerer as he is getting older but Sompla refuses. The tribe exchanges goods from the forest with Thai villagers at the market. Anao, the village leader’s son, is good at sales so Lamhap’s parents appreciate him. The movie highlights their everyday life in the forest, i.e. getting fruits and food from the forest, be aware of danger such as snake and tiger... It is a beautiful ode to natural life. There is a contest to shoot flowers and to win ladies hearts. Jealousy happens between Sompla and the village leader’s son, Anao (Pinyo Parnnui), as both love Lamhap. Lamhap prefers Sompla but the marriage decision is linked to her parents’ choice. The village leader wants his son to become the next leader and wishes Anao to marry Lamhap. After a misunderstanding with Sompa, Lamhap accepts to marry the village leader’s son. The wedding is beautifully shot, and it reminds about Thai movie "The old scar" (แผลเก่า), which also features portraiture of Thai culture and way of life through a tragic romance. Sompa ruins the wedding night by making noise and sending rocks on their roof. While Anao goes out to catch the intruders, Sompla kidnaps Lamhap. The movie includes beautiful ambient light shooting with torches as the village leader’s family is chasing them. Sompla and Lamhap flee. They go deep inside the forest. They are tracked down due their fire smoke. A fight happens between Sompa and Anao. The winner shall get Lamhap. Sompa wins by attracting Anao inside the deep forest instead of fighting inside a clearing. Unfortunately, another fighter shoots Sompla with a poisonous arrow. Sompla dies and Lamhap kills herself over Sompla's body. 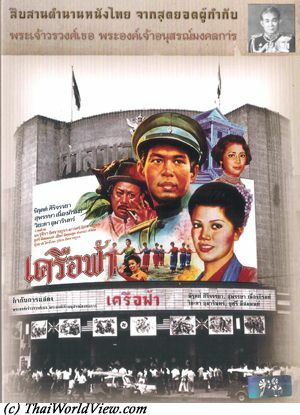 This movie was directed by the General Major His Royal Highness Prince Bhanu Yukol, a pioneering Thai filmmaker. He was the uncle of famous director Prince ChatriChalerm Yukol. 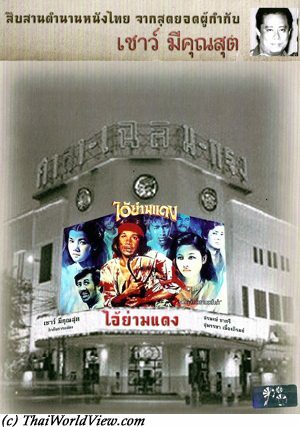 Thai actor Jatuphol Poopirom received a posthumous Thai award for his performance as he died in 1981 in a car accident. The movie soundtrack mixes a traditional and entertaining music. 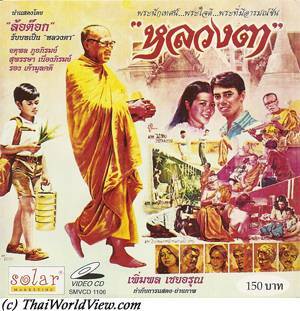 It is based on a novel (Romance of the Sakai) by Thai King Rama 5. 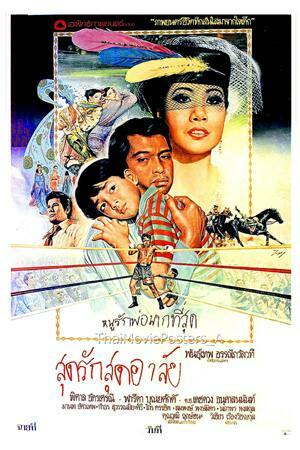 The Culture Ministry registers 25 Thai classic films each year at the National Film Heritage Registry. 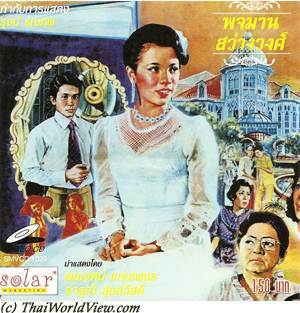 This movie is part of the 25 films heritage list announced on 04 October 2015, which is Thai Movies Conservation Day. It is a love story about a girl named Pojaman from a noble family who fights with relatives to obtain her right as the real owner of the castle. The fighting ends in happiness when she finds true love with the son of one her relatives that she is fighting with. This story has been made into a film and a television series several times in the past four decades. 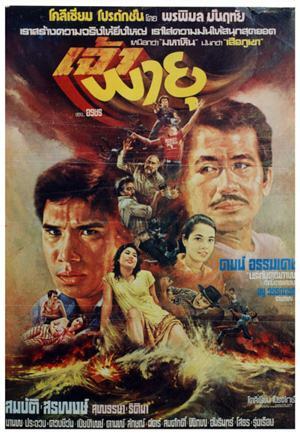 Thai movie ผีหัวขาด was released in year 1980. It is a lost movie in Thailand. Luckily it was released under VHS format in Taiwan under the name “Siamese curse” / 鬼貢头 in year 1980. 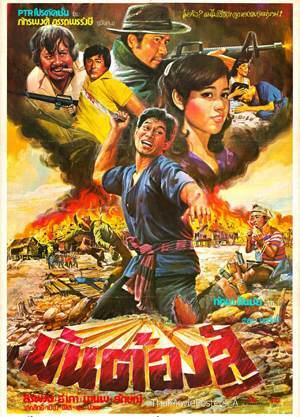 It was also released in year 1984 in Malaysia under the name “SUMPAHAN SIAM”. SUMPAHAN SIAM was released in Malaysia so it is dubbed in Malaysian. The VHS features subtitles in English, Chinese and Malaysian! It only lasts 1h17mn. A remake was released in year 2002. Chiao (Sorapong Chatree) and young lady Hsiao Feng (Wassana Sitthiweth) are close friends. Chiao dreams about marrying Hsiao Feng. Settha Sirachaya is Chiao’s close friend. Lor Tok is one of the village masters (หมอผี). Settha Sirachaya asks for love oil to master Lor Tok. Villager Ken's head is found by Lor Tok during incantations. Those repetitive deaths are worrying so village leader asks for defense troops volunteers in order to protect villagers. Chiao (Sorapong Chatree) and Settha are volunteers. Another villager Ah Hing disliking Chiao is volunteer also. Chiao loves Hsiao Feng but refuses to use love oil done by master Lor Tok. Ah Hing has arguments with Chiao. Ah Hing’s father is played by Siripong Isarangkul. A festival is happening so ruffians wish to steal the golden Buddha statue located in the local Buddhist temple. Chiao visits his master, who warns him that he is in danger. He should ordain as monk the day after to avoid losing his life. Chiao acknowledges and leaves. On the way home, a storm occurs, and he looks for a shelter. He ends up in the village Buddhist temple and sees ruffians stealing the golden Buddha statue. He tries to prevent the robbery, but he is killed by ruffian Pinyo Parnnui. His head is cut, and his body hidden in the graveyard. The ruffians fail to steal the Buddha statue. On the following day, Chiao cannot be found in the village. While looking for dead bodies to do corpse oil, Lor Tok finds Chiao's body. Villagers are now aware of his death. The master promises to find the head in order to do a proper cremation ceremony. Meanwhile Chiao’s body wakes up and is looking for his head. He frightens villagers. Ruffians try to steal the golden Buddha again but Chiao stops them. Finally Chiao finds his head. During the village festival, Lor Tok stains Hsiao Feng’s dress by mistake. She goes to the nearest house, i.e. Yin Hing's place, to clean it. There Hsiao Feng finds all the Buddha statues’ stolen heads, so the ruffians have to kill her. Settha interferes and is injured. Villagers try to stop them. Ah Hing threatens to kill Hsiao Feng. Chiao chases them but Siripong involves one skilled master also to fight against Chiao and his master. Chiao’s master is defeated. Chiao breaks his opponent's spells. Siripong and Pinyo get killed. The master burns in the fire. Chaio’s body and his head get cremated in the big fire. 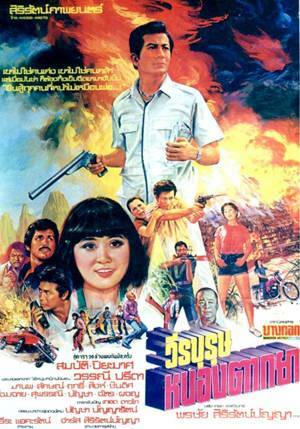 Thai action movie วีรบุรุษหนองตากยา was released in year 1980. It features Sombat Methanee as main actor and Piyamas Monayakol as main actress. The movie is lost in Thailand but a 1mn30s trailer is still available. Other actors include Manop Aussawathep, Lak Apichat, Rith Luecha, Suphanee Jitthieng, Chat Mongkolchai, Boo Wibunnan. During the short trailer, a few sequences can be seen. They are related to some fightings involving Sombat, Manop playing a hitman again, ruffian leader played by Sing Milinsasai and scolding his teammates… A partial summary is still available. Boo Wibunnan is an influential man buying coercively sugar canes from local farmers but at a much lower price than the governmental prices. He is helped by local subdistrict headman Ying (Sing Milinsasai), who is a former ruffian leader. Sombat Methanee is a doctor working at the medical dispensary in Nong Takaya (นองตากยา) village. Seeing the ruffians bad behavior, the doctor decide to help the villagers. It deals about the adventures of Thai cowboys sending cattle through Isan area to Nakhorn Ratchasima. Outlaws are waiting to steal the buffaloes. The "Nai Hoi" were historical local cattle merchants leading buffalos from Isan to the central regions of Thailand to sell them. This movie has an unique feature, i.e. actors use Isan language to speak. 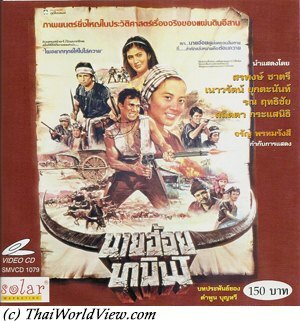 This movie highlights the life of rural people in Isan in historical times. 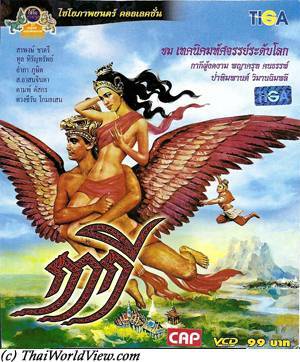 A Thai TV serie based on the movie was shot in 2001. 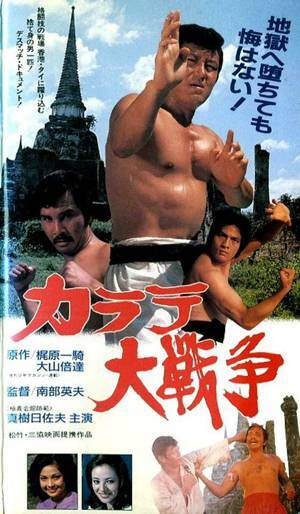 Thai Japanese movie ศึกคาราเต้ / カラテ大戦爭 / “Karate Dai Senso” was released in year 1980. It lasts 1h26mn. The movie was released under VHS and recently under DVD in year 2013. It is also known under the Thai name of คาราเต้บันลือโลก. A Japanese lady meets a man called Datsu (Hisao Maki), working as taxi driver. She hasn't met him for years. He was a karate teacher and she was a school student. He finally trains again and agrees to overseas to verify the superiority of Japanese Karate over other Asian martial arts. Some people in Japan try to ensure he will fail. He comes to Hong Kong and falls in a trap. It is fighting Kung Fu vs Karate. He is attacked many times but succeeds to survive despite being injured. He finally defeats the black dragon expert. Datsu then comes to Thailand. Dam Datsakorn as King Cobra is a Thai boxing champion. Metta Roongrat is his wife. Scenes in Thailand show Nakhon Pathom, Damnoen Saduak floating market, huge billboards with Thai movies posters. Chanee Yotchai as hitman tries to kill Datsu as ruffians fail to defeat him. Cobra prevents the hitman to hurt Datsu as he wishes for a fair fight. The Japanese lady tries to prevent Datsu to give up fighting by offering her charms but he still goes. Metta tries to prevent Cobra also but he still goes. Finally the two men fight until death happens for both of them. 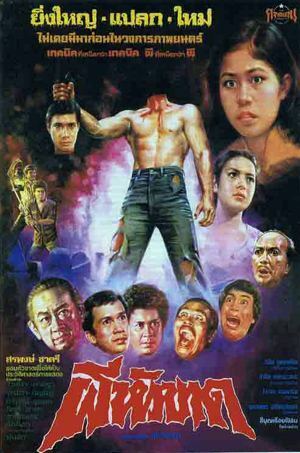 Thai HK movie Fearless Hyena 3 / ไอ้หนุ่มหมัดพังพอน was released in year 1980. It lasts 1h23mn. This movie features Jackie Chen and Bruce Thai. Jackie Chen has a very similar face to Jackie Chan. Certainly such movie wanted to take profit from Jackie Chan’s celebrity. Ruffians are looking for a jade. As the father doesn’t disclose the location of the jad, his son called Jackie is beaten by three men. Hopefully he is rescued by a group of two men and a young woman called Kailye. Jacky got the Flying jade embedded in his body so ruffians are chasing him. This stone allows the owner to fly and to jump very high. Kailye and her father, Luechai Natnat, train Jacky so that he can better defend himself. Jacky is stronger but not enough to defeat ruffians. So he gets help from other men (Bruce Thai). The ruffians' team includes Bolo Yeung. Jackie gets additional training from an old drunken master. Trainings take a big part of the movie. The movie ends up with a confrontation with the Snake gang. Jacky Chen, Kailye, Bruce Thai defeat the ruffians but Kailye's father dies. The dubbing is pretty poor. A Thai man working for the government is killed while sitting on a rickshaw. Before dying he asks the rickshaw's driver to continue his secret mission. Many funny situations happen as the rickshaw's driver is not used to act like a Thai James Bond... Lor Tok and Thep Thienchai were two famous Thai comic actors. 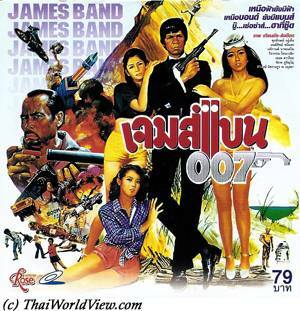 The full title is เจมส์แบน 007 น้ำพริกไทยเนื้อแท้ (James Band 007 the real Thai pepper). 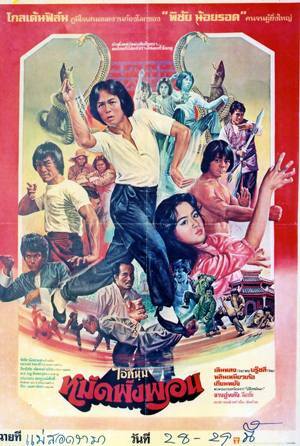 This movie is a parody of Hong Kong Kung Fu movies that were popular in Thailand during 1970s decade. Thao Huay is a traditional Thai man selling healthy Chinese soups. His family is originating from China. Thao Huay's father gets beaten by some members of the Kung Fu school Snake Boxing (มวยงู) and dies. Aspiring for revenge, Thao Huay looks for a master to learn boxing and become a disciple (ลูกศิษย์). Meanwhile Thao Hua meets a young Thai lady called Waan, who is papaya salad seller (แม่ค้าส้มตำ). He has arguments with her in the local market (ตลาด) regarding a selling site location. Waan learns that her real father is Chinese so she goes to live together in his home with her mother. His Chinese father has already a wife so there are arguments who is the main wife (เมียหลวง) and who is the minor wife (เมียน้อย). The father is having a jewelry (ร้านทอง). Sompong, a rich young coming back from America, tries to seduce Waan but Waan still has a sweet spot for Thao Huay. A robbery is happening at the jewelry. Robbers hide the jewelry inside Thao Huay's palanquin. Thao Huay faces hardships during the training with the master. He learns the monkey dance (รำมวยลิง). This dance skills gets highest efficiency if the fighter is drunk also. Waan is kinadped by Kung Fu school Snake Boxing. Thao Huay is going to rescue her. With the help of his master, the Kung Fu school is defeated. Thao Huay gives back the gold and can marry Waan. The story takes place in Isan region, Northeast of Thailand, in Yasothon province. Local traditions are nicely shown in this movie. Molam (หมอลำ) music is played with reed mouth organ (แคน) during the village feast. Bald men compete against each other, head against head. This traditional game is called “Bald head smashing” (หัวล้านชนกัน). Isan traditions such as dances and music are featured. A mother has two grown-up children. She is always worried about them (ลูกแม่ เป็นห่วง). Thong is her son and Boonsi is her daughter. Thong gets seriously hit on the head during a fight and it takes him a few days to recover. Typical Isan ceremonies such as Bai si Ceremony (พิธีบ่ายศรีสู่ขวัญ) are shown. Villagers techniques to get red ants (มดอดง), to get small wood, to catch tree lizard (กิ้งก่า), to capture frog (กบ) or fishing methods are nicely shown. Life was harsh in villages with no electricity. There is only one season for rice so most of the time rice fields are dry. SaiBua (สายบัว) is a young village girl. Saibua and Thong love each other. Thong needs to fight with a young man called Sao as they love the same woman. Finally Saibua becomes Thong's wife but outside a wedding. Her family has no choice than accept (ยกให้). A proper wedding is organised. Sing and Boonsi do the same thing! The grandmother wants a grandson (หลาน). Thong loses money when playing game so making his wife and mother upset. Thong has a crisis and almost hit his wife and mother. Life is ongoing through the seasons. SaiBua is now pregnant. Saibua dreams that Thong’s mother is leaving them as she saw her as a nun (แม่ชี). One day the mother is giving alms at the village Buddhist temple. Thong is in rice fields using his buffalo to work on the soil. Saibua is at home doing chores. His mother prepares sticky rice for him. But Thong starts to be upset as he has no food to eat. He is very angry. He believes a little bit of food is given to him. Losing temper and without really noticing it, he hurts his mother. As sticky rice was compacted, it is in fact a lot and Thong is not able to finish it. He realizes too late that he has hurt and killed his own mother. He is a bad son as he hit his own mother. A trial (ศาล) is organized to judge Thong. He has done a sin (ปาบ), he is an ungrateful child (ความชั่วของลูก), an evil person (สัตว์นรก, ลูกทรพี). He gets authorisation from the tribunal to build a small pagoda (พระธาตุ) to host his mother bones (เวรกรรม). He works very hard under the harshness of a guard. The small food he gets is offered to his mum. The pagoda is finished (ขออิฐ) as a way to compensate (ชดเชย) his evil part. He has difficulty to get separated from his wife, child and sister but it is time for punishment. His head is cut. During the last executor dance, the executor reminds to Thong that there is nothing personal and it is just his duty to perform. This story ensures that Thai children always respect their parents and the pagoda is said to be located in Yasothon province (ธาตุก่องข้าวน้อยฆ่าแม่ จ.ยโสธร). This movie belongs to the same movie family as “A Child of the Northeast” (ลูกอีสาน) as it gives a realistic picture of Isan region. The movie picture is quite colorless sometimes. 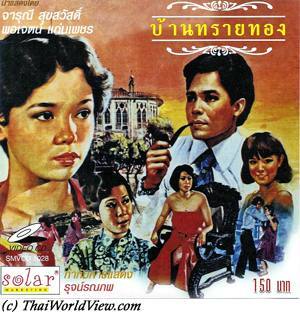 Thai movie ขุนเดช was released in year 1980. It takes place in Sukhothai historical park area before it became an official park (1988) as there was still heavy vegetation around the Buddha statues. The movie lasts 1h46mn. 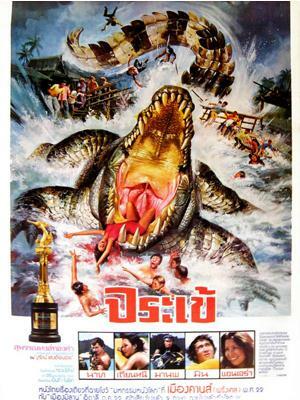 This movie was only released under VHS in Thailand and Sweden. Two men are killed by Khun Det (Sombat Methanee) as they are digging in order to steal Buddhist artifacts. Ruffians arrive in the village and hire farmers to dig around in order to find relics. Village leader (ผู้ใหญ่) Sompong (Sompong Phonmitr) refuses to help as it is ancestor's' heritage so it shall not be sold to strangers. Sompong has a mute daughter (Pornpan Ketmamatsu). The leader (เจ้านาย)(ภูมิ พัฒนายุทธ) is looking for Buddha statues (พระสักองค์). Sompong informs the temple abbot that the ruffians even dig near old sacred pagodas but nothing the abbot can do (สัตว์นรก). Khun Det, aware, chases away the workers. Khun Det is then captured, crucified and suspended to a headless Buddha giant statue. Khun Det is rescued by Sompong and his daughter. Khun Det repairs an old gun (ปืนเก่า). 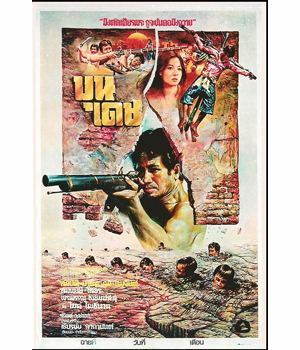 As the ruffians are evacuating Buddha statues by boat, Khun Det sinks the boat thanks to his gun. It reminds the scene of Naresuan 2 with the King shooting very far away with a gun to defeat the Burmese king. The leader, seeing that Khun Det is bringing them serious troubles again decide to flee by car with some Buddha statues. Khun Det prevents him to flee by destroying his car and killing him. 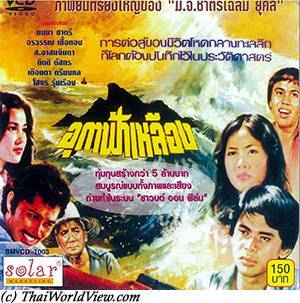 The father (Somjin Thammatat), in ire as his son is dead, storms the village with ruffians but is unable to find Khun Det. They burn belongings of villagers and threaten the abbot. The father destroys pagodas and tries to bury a big Buddha statue. Khun Det prevents them so the father finally calls Manop Aussawathep, a professional killer. He shots Sompong. This movie also reminds of western such as “The Magnificent Seven” with people protect villagers against ruffians as there is no police. Manop then buries men alive to force Khun Det to show himself. The villagers fight back. The father and his ruffians are killed. Khun Det defeats Manop through an epic final fight. It is a strong movie with violent deaths (heads cut as ruffians cut Buddha statues’ heads). Khun Det finally leaves. A Thai serie ขุนเดช was released in year 1999 with Phongphat Wachirabanjong. Another version was released in year 2012. In Northern Thailand, a district officer is shot in the back. He was fighting against illegal trees cut. It is the fourth officer killed on duty in five years. A new one (Sombat Methanee) is nominated. The new district officer understands very fast that a latent corruption happens and that local people (ชาวป่า) are expected to give gifts (chickens, daughter given as maid as a compensation of non paid debts...). The new district officer's adjoint is called Palat and is played by Suchao Pongwilai again with brio in the role of rogue officer. Sor Asanajinda plays the role of a brusque villager complaining indirectly regarding rampant corruption. His son Pol (Sorapong Chatree) is also very active. The minister who sent the district officer has problems with his own daughter, Nit (Jarunee Sooksawad), due to misunderstanding with his new wife. She leaves for the same village Daran Thong and becomes the local teacher. Nit has also medicine knowledge and has to face local fear of ghosts and sorcerer (หมอผี). Old people prefer using sorcerer instead of modern pills. Thanks to Nit and with Pol's leadership, the farmers ask for higher prices and debts resettlement to the trader. Local trader tries to corrupt the district officer but fails to do so. The corrupted subdistrict headman (กำนัน) and trader start to be very upset. They try to buy land as they know that a road will be built to the village but Pol asks villagers to refuse to sell. The subdistrict headman daughter Sophit is back from studying abroad. Palat is secretly fond of her. A young lady called Bukham is raped and killed by Palat. Palat accuses Pol with false proofs. Pol flees and discovers that many trees are cut illegally. Nobody speaks due to fear. The new district officer asks Pol to surrender if he is innocent. Pol's father is found hanged as he spoke too much (พูดประชด - พูดมาก) against corrupted officers. The adjoint uses local people to build the road at a cheaper price. Nit brings the villagers to the province officer to ask for full payments and she wins. Meanwhile Palat rapes the subdistrict headman daughter Sophit and strangles her. Pol's brother sees it and warns his brother. Sabin and Nit get attacked. Sabin is captured but Nit can flee. Nit and Pol come to help Sabin and bring Sophit's dead body to the subdistrict headman. This one wishes to kill Palat as revenge but gets shot before. Finally Palat gets smashed by a log in the illegal logging factory and the district officer helps to catch all ruffians. A school and hospital shall be built by the previous corrupting trader. The movie finishes happily, Nit is named school director (ครูใหญ่ใหม่), Pol is named new subdistrict headman (กำนันใหม่). This movie with social and meaningful messages also involves comedy and romance and not only pure drama. A new generation of government officials is here to replace the previous corrupted generation. ChatriChalerm Yukol portrays environmental problems in this movie about the sea overexploitation in South of Thailand. Sam is a young fisherman living with an old man. Sam has a lazy girlfriend called Boonta. The old man has also adopted a young girl, Dookmai, 10 years ago when her parents died in a forceful storm over the sea. Such forceful storm accompanied with a yellowing sky is called อุกาฟ้าเหลือง. The old man lives in harmony with the sea and blames fishermen who uses grenades to catch fish. These grenades kill many fishes and destroy the coral, which hosts fishes. Once the coral is dead, fishes disappear. It is an easy way to get immediately many fishes but without thinking about the future impacts. It is forbidden by law but a local politician with the fishermen boss is preventing any changes. Boonta wants a better life and convinces Sam to leave the old man in order to work with other fishermen and earn more money. Sam is working hard on a big drifter with huge nets that catch big, small fishes and even species that are not edible. if fishermen catch small fishes, those small fishes can never grow and reproduce them-selves. The old man successfully succeeds to have the sea police to capture a fishboat using grenades to catch fishes. One fisherman group leader promises to get his revenge. Meanwhile the local politician and the fishermen boss have arguments. The local politician hires a hitman to kill him. The hitman knows Boonta since her youth. Boonta is seduced by the man as he is offering to her an opportunity to leave the South and go to Bangkok. They become lovers. The fishermen boss is killed but before his death tells everything to Sam. Sam repeats to Boonta, who then tells her lover, the hitman. Following a tragic chase in the mangrove, the hitman kills her and decides to get rid of Sam also. Followed by the hitman and the fisherman group leader, Sam, who is injured, take refuges in the old man's house. The old man, knowing that another forceful storm is coming, goes to face the hitman in order to slow him down. He dies but both the hitman and the fisherman group leader disappear within the sea due to forceful storm. Those who hurted the sea have been punished by the sea. It is certainly Sor Asanajinda's best role ever as an old fisherman respecting the sea.